LEGO began in the workshop of carpenter Ole Kirk Christiansen (1891–1958), from Billund, Denmark. In 1934, his company was called Lego, from the Danish phrase “leg godt”, meaning “play well”. In 1947, LEGO expanded to plastic toys and in 1949 an early version of the now familiar interlocking bricks, called “Automatic Binding Bricks,” were being produced. The company’s motto is “det bedste er ikke for godt” which means “the best is never too good”. Still used today, it was created by Christiansen to encourage employees to never skimp on quality. By 1951, plastic toys accounted for half of Lego’s output, even though it was believed that plastic would never replace traditional wooden toys. It was Christiansen’s son, Godtfred, that saw the immense potential in Lego bricks, but they still had some technical problems: their locking ability was limited and they were not versatile. The modern brick design was developed and patented on January 28, 1958. In 1969, Duplo was introduced. A simple set of blocks twice the width, height and depth of standard Lego blocks and aimed towards younger children. In February 2015, Lego replaced Ferrari as the world’s most powerful brand. 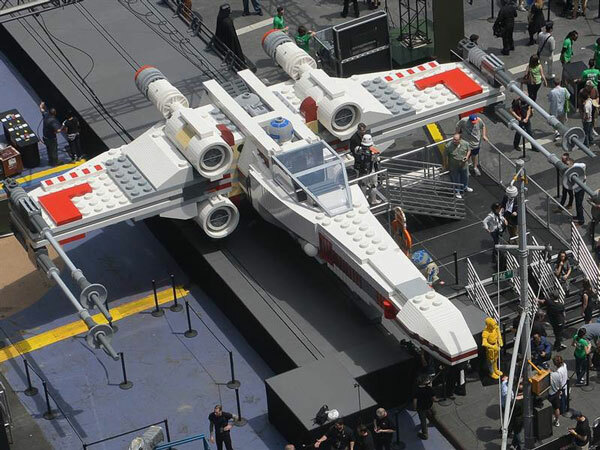 The largest model ever created with LEGO was displayed in New York City in May 2013, and was made of over 5 million bricks; a 1:1 scale model of a Star Wars X-wing fighter (as shown above). Other records include a 112-foot tower and a 4 km railway. Lego is found everywhere around the world – outside of kids play rooms. There are Legoland Amusement Parks, Legoland Discovery Centres, retail stores, video and board games, television shows, major motion pictures, books and a clothing line. As a full-grown man, I remember growing up with a suitcase full of LEGO. I would spend hours and hours in my room surrounded by thousands of different sized colour plastic bricks. Even today, I can sit down and create a house, car or whatever my imagination comes up with – it never gets old. LEGO bricks, as we know it today, is celebrating 60 years, and if its current popularity is an indication of anything, another 60 plus is definitely in its future.